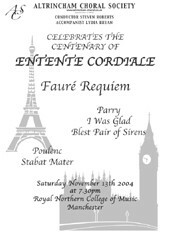 The society’s celebration of the Entente Cordiale was a concert of contrasts. The opening work, Parry’s Blest Pair of Sirens, was performed with the choir’s customary confidence and aplomb supported by the majesty of the organ played by Roger Bryan. We needed the shot of adrenalin for Poulenc Stabat Mater, which followed. This is probably the most demanding work we have attempted in recent months. Saturday’s performance was exciting and nerve-racking and a real test of teamwork. Lydia’s accompaniment and Steven’s panache with the baton ensured that the audience was not disappointed. Soloist Kate Brian conveyed a bereaved mother’s anguish with chilling conviction, which was particularly poignant at this time of Remembrance. It is a tribute to Steven’s ambition for the choir that he chose a work that is not a staple of the amateur choral repertoire and it stretched us: we met the challenge! It was almost a relief to start the second part of the concert with the familiar I Was Glad When they Said Unto Me. No time to relax though, when the choir is divided into eight parts for this grandiose setting of part of Psalm 122 listening, watching and singing is the epitome of multi-tasking. But we were indulgent and enjoyed singing this very English music. Our final piece was the much-loved Fauré Requiem. It’s an audience-pleaser but none the worse for that. The sopranos produced a quite superb ethereal sound, moving and lyrical and avoiding saccharine sentimentality. We were blest in our soloists, soprano Kate Brian and baritone Andrew Slater who were both inspiring. We are fortunate to have a musical director with vision, a superb and unflappable accompanist and access to the RNCM for our concerts.